As a pair, Unbreakable and Split delivered a sharp, “life imitates art” conceit. Comic books represent life – social issues, injustice, moral right – and M. Night Shyamalan’s film duo flipped comic quirks into our reality. They were subtle films, and in Unbreakable’s case, years ahead of superhero cinema. It’s never entirely clear what Glass is supposed to suggest. The three superhuman protagonists endure doubt in Glass; they can’t be real. They cannot exist, so says the psychiatrist Ellie Staple (Sarah Paulson) studying their behavior. Yet that never makes sense. Bruce Willis’ caped vigilante David Dunn was clearly established as nigh invincible. It’s demonstrable. A psychiatrist telling him his bones can break – when they cannot – isn’t convincing. Glass wants the reality of Unbreakable and Split without exposing itself. It’s redundant, like a collection of deleted scenes from those movies, rejiggered into this mass that goes nowhere. 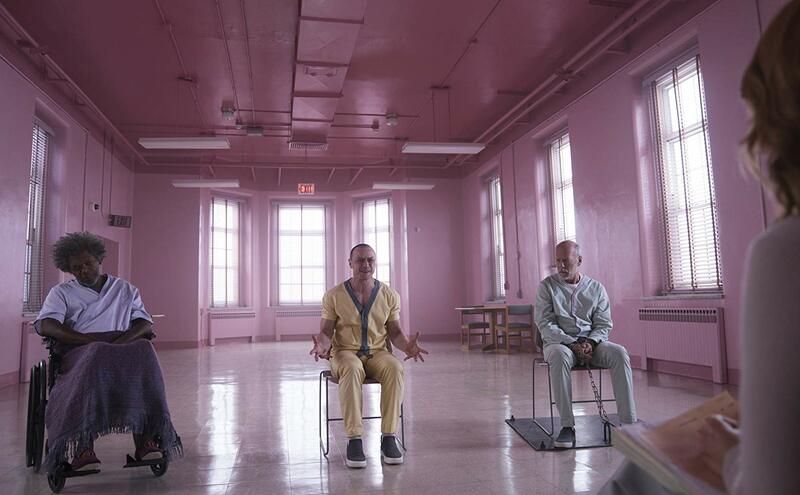 Glass is character development without a goal, and crucially, without the satisfying bite of a comic book finish. Glass also wants to be a comic book movie. It says so. Mr. Glass (Samuel L. Jackson) repeatedly vocally notes source medium’s core tenants. He speaks out loud of side characters, subplots, heroes, villains, and themes. Those were underplayed previously, to genius in Unbreakable, to shock in Split. Here, it’s as if Glass wants to be sure everyone understands this is, indeed, a comic book movie. Shymalan’s work is endearing to watch. Placement within a barren, even blank psychiatric hospital keeps the material cold and unfeeling. Camerawork uses a number of specialized viewpoints, off-putting in the right way as to frequently push viewers off balance. Glass at its best is sitting back in admiration of its movement, not the stagnant fumble of this story. Of course, this all comes together in a twist ending – a dual twist ending, because this is Shyamalan. One exposes the greater world of this trilogy beyond the Philadelphia setting, and ultimately a hateful and cruel suggestion. Nazi-esque, even. The second is an utter dud, insultingly idiotic in how little is solved. If there’s a greater message to Glass (all great comics have one), it’s to accept those with differences. Don’t reject them, but celebrate their unique identity. Or, it’s in Kevin (Jame McAvoy), with his multiple personality disorder whose gentle nine year-old self adores what he is. He looks up to himself with eyes not yet exposed to grit, grime, and spite of this world. There’s innocence and optimism left in people and in comics. That same innocence is what this stealth trilogy built itself on. Turns out, it lost the simple innocence too. A wounded finish to M. Night Shyamalan’s stealth trilogy, Glass over-celebrates to send this series off with a clumsy climax.